fresh fruit like strawberries…with lemon poppy seed dressing and some feta cheese. It is truly summertime heaven! With some of your favorite topping salads don’t have to be the lunch you want to avoid! How do you dress up your salad? I usually top my salads with sunflower seeds and chickpeas. I also jam pack my salads with an assortment of veggies, spinach, and an assortment of lettuces. Aside from Fattoush dressing (Middle Eastern), I am not big on salad dressings but my hubby is. I usually make him an Italian dressing for his salads. Chickpeas are something that I never think to put on my salad. I will have to remember that for next time! I also need to try my hand at some Italian dressing do you use a recipe or just add a little of this and a little of that? And I have never heard of Fattoush dressing do you make your own or buy it? For the Italian Dressing, I use the recipe from “The Saucy Vegetgarian” by Joanne Stepaniak. I will get you recipe. It is easy to make and Rob (my hubby) says it is really good. Fattoush Salad is like the Lebanese equivalent of a house salad. I will also get you the exact recipe. I base my recipe for the dressing from the one in Rose Nader’s cookbook (Ralph Nader’s mom). 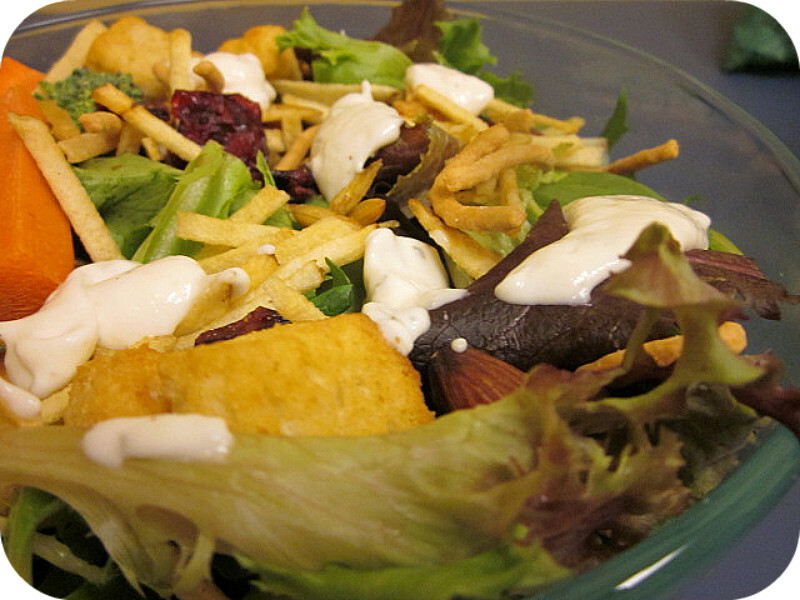 It usually is romaine lettuce, cucumbers, tomatoes, onions, parsley, and pita croutons for the salald. The dressing has olive oil, lemon juice, mint, sumac…. I used to live near Dearborn, MI which has a large Middle Eastern population and fantastic and cheap restaurants. When we moved to Chicagoland, I was forced to try my hand at making my own fattoush. Ohhh I am so excited for the recipes! Just checked here at the ‘brary and we don’t have either of those cookbooks…I’m thinking maybe I need to place a couple of requests! 1 or 2 cloves garlic, crushed with your knife and then minced. Mix all together with a whisk in a bowl. I usually do a 2:1 ratio for olive oil to lemon juice. You can also use two teaspoons dried mint for the fresh mint but I think the flavor is so much better with fresh. For the olive oil, I use an extra virgin olive oil that I bring back with me from a Lebanese bakery in MI. Combine all the ingredients in a small bowl. Whisk together until emulsified. Recipe adapted from “The Saucy Vegetarian” by Joanne Stepaniak. Definitely see if you can get a library loan for this book. It has a lot of good dressing recipes. I’ve made several different ones for my husband but this is the one he likes the most. Rose Nader’s cookbook is called “It Happened in the Kitchen”. It is from 1991 and might be out of print. My libary district when I lived in MI didn’t have the book in their inter-library loan system so I bought my copy for a few bucks on eBay. It is a Lebanese cookbook and had a wide variety of recipes. I can’t wait to try these out thanks for sharing them! Greetings I stumbled on your site by mistake when i was searching Google for this topic, I must point out your webpage is absolutely valuable I also like the theme, it is beautiful!